As reported yesterday in one of two exciting pieces of Assassins Creed news, the series' regular protagonist shall be joining a host of fighters in the upcoming Soul Calibur V.
Along with this announcement, Soul Calibur V's developers, Namco Bandai released the first details for the Soul Calibur V Collectors Edition, which can be seen in the photo below this post. Soul Calibur V Collectors Edition will be packed in what appears to be an imitation leather book, which will come packaged with a CD copy of the original soundtrack, a parchment signed by the development team at Project Soul, an art book, a making of DVD, and two sets of armour for the character creation mode. 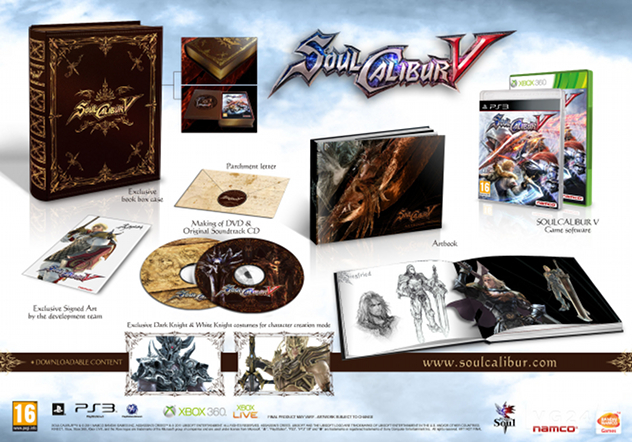 Soul Calibur V Collectors Edition will be available to purchase on either the Xbox 360 or the Playstation 3.